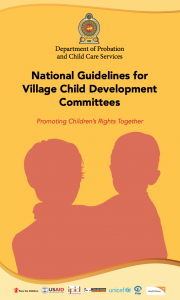 The National Guidelines for Village Child Development Committees - Promoting Children's Rights Together, is a publication by the Department of Probation and Child Care Services (DPCCS), Ministry of Women and Child Affairs (MWCF), Save the Children International, UNICEF, World Vision, and Plan International. The intention of strengthening the Village Child Development Committee (VCDC) is to ensure an engaged, proactive and community based process in promoting children’s development and an effective protection system at the village level in Sri Lanka. This manual was launched on January 27, 2016.